The Safari Ltd is the premier figure company specializing in educational toy reproductions. It produced the Carnegie Safari series in conjunction with the Carnegie Museum in Pittsburgh Pa. It also has the Wild Safari , Dinosaurs of China, Missing Links prehistoric mammals, Habitat and Wild Things baby dinosaurs series. 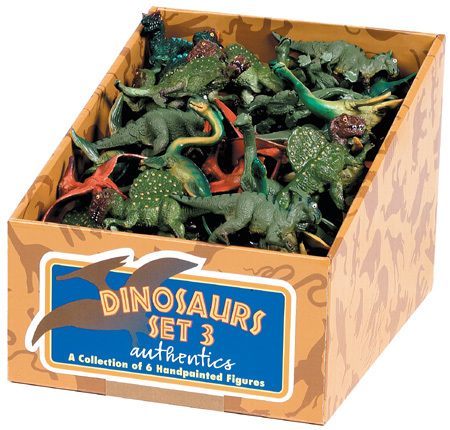 It has also produced single issue toy dinosaurs not assigned to any series. Wild Safari was originally a low priced price impulse buy. 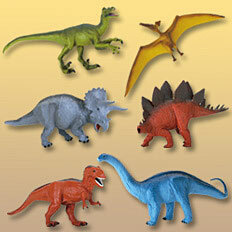 It has been developed into a line of paleo art toy figures. Most companies have moved away from the museum concept and have a version the paleo art theme rather than the museum format. The Toob concept is the US version of th Japanese UHA collections. The most inovative concept in the figure market. 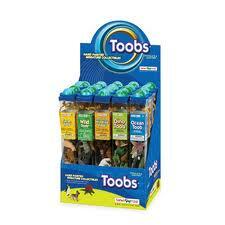 Each toob has a theme with 10 - 12 figures. The figures on often in the style of Wild Safari or the older Habitat Safari figures. For 2005 Safari release a Mammoth with calf, Smilodon, and cub and Sloth. In effect the same mammal figures done by Marx. In 2006 Ambelodon, Arsinotherium, Andrewsarchus and Doedicurus . Recasts in 2016. These are the best sand box style figures sold. The figurs are hollow vinyl. 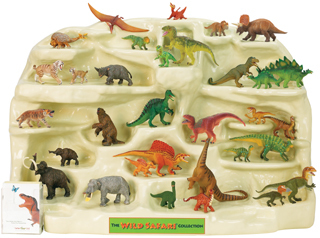 The are in the style of the orginal Wild Safari figures from Galaxy toys. Ideal product for preschoolers. Field Museum, Habitat, Good Luck Mini, Dinosaurs of China and Missing Links. The Museum company for Dinosaurs not the first but was the largests and most long lived. This was the template for for the modern Museum line. It should be regarded an independent product for the othe Safari Ltd. series. Retired 2015.